Is make with children eat, such good! 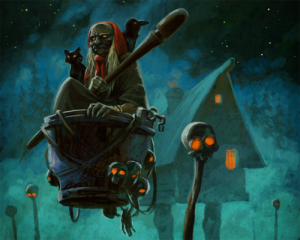 The podcast is on chicken legs this week, as Flora and Stecco discuss the legendary Baba Yaga. A Russian witch (or rather THE Russian witch), Baba Yaga has terrified Slavic children and adults for ages, but don’t let her horrid demeanor fool you – she’s more complex than you think. Dave and David talk about the impact she has had on society and the impact society (read: religion) has had on her. Leave the lighted skull on, the mortar is coming in for a landing on this episode of Blurry Photos!